The theological basis for the feast is the doctrine that the souls which, on departing from the body, are not perfectly cleansed from venial sins, or have not fully atoned for past transgressions, are debarred from the Beatific Vision, and that the faithful on earth can help them by prayers, almsdeeds and especially by the sacrifice of the Mass. Pope Benedict XV granted Priests permission to offer three Masses on All Soul’s Day. One of these Masses the Celebrant may say according to his own intention; one must be offered for the faithful departed and the third for the intention of the Holy Father. FIRST MASS: O God, the Creator and Redeemer of all the faithful: grant unto the souls of Thy servants and handmaidens the remission of all their sins: that through devout supplications, they may obtain the pardon which they have desired. Who liveth and reigneth with Thee in the unity of the Holy Ghost, God, Forever and ever. R.Amen. SECOND MASS: O God, the Lord of mercies, grant to the souls of Thy servants and handmaids, the anniversary of whose burial we commemorate, an abode of refreshment, the beatitude of rest, and the brightness of light. Through our Lord Jesus Christ, Thy Son, Who liveth and reigneth with Thee in the unity of the Holy Ghost, God, Forever and ever. R.Amen. THIRD MASS: O God, the bestower of pardon and lover of man’s salvation, we beseech Thy clemency, through . the intercession blessed Mary ever a virgin, and all Thy saints, that the brethren, who have passed out of this world may together enjoy everlasting happiness. Through our Lord Jesus Christ, Thy Son, Who liveth and reigneth with Thee in the unity of the Holy Ghost, God, Forever and ever. R.Amen. Lesson from the Epistle of blessed Paul the Apostle to the Corinthians. Brethren, we shall indeed rise again, but we shall not all be changed. 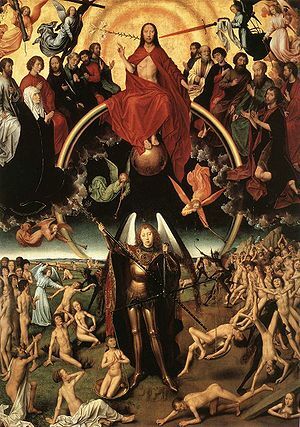 In a moment, in the twinkling of an eye, at the last trumpet; for the trumpet shall sound, and the dead shall rise again, incorruptible and we shall be changed. For this corruptible, must put on incorruption and this mortal must put on immortality. And when this mortal hath put on immortality then shall come to pass the saying that is written, Death is swallowed up in victory. O death, where is thy victory? O death, where is thy sting? Now the sting of death is sin: and the strength of sin is the law. But thanks be to God, who hath given us the victory through our Lord Jesus Christ. Lesson from the Book of Machabees. In those days, the most valiant man Judas, making a gathering, sent twelve thousand drachmas of silver to Jerusalem for sacrifice to be offered for the sins of the dead, thinking well and religiously concerning the resurrection (for if he had not hoped that they that were slain should rise again, it would have seemed superfluous and vain to pray for the dead); and because he considered that they who had fallen asleep with godliness, had great grace laid up for them. It is therefore a holy and wholesome thought to pray for the dead, that they may be loosed from sins. Lesson from the book of the Apocalypse of Blessed John the Apostle. In those days I heard a voice from Heaven, saying to me, Write, blessed are the dead, who die in the Lord. From henceforth now, saith the Spirit, that they may rest from their labors, for their works follow them. O Lord Jesus Christ, King of glory, deliver the souls of all the faithful departed from the pains of hell and from the bottomless pit: deliver them from the lion’s mouth, that hell swallow them not up, that they fall not into darkness, but let the standard-bearer, holy Michael, lead them into that holy light; which Thou didst promise of old to Abraham and to his seed. V.: We offer to Thee, O Lord, sacrifices and prayers: do Thou receive them in behalf of those souls of whom we make memorial this day. Grant them, O Lord, to pass from death to that life which Thou didst promise of old to Abraham and to his seed. 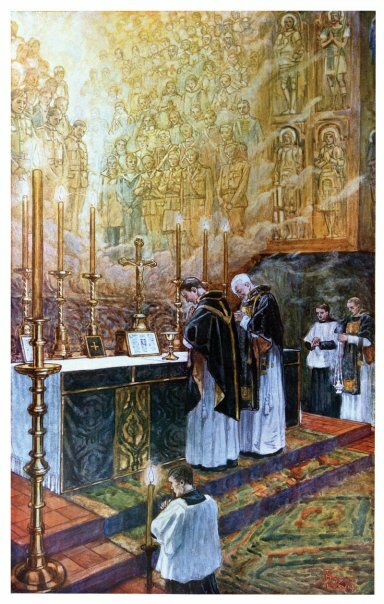 SECRET for the FIRST MASS OF THE DAY Mercifully look down, we beseech Thee, O Lord, upon the sacrifice which we offer Thee for the souls of Thy servants and handmaids, that, to those on whom Thou didst confer the merit of Christian faith, Thou mayst also grant its reward. Through our Lord Jesus Christ Thy Son our Lord, Who liveth and reigneth with Thee in the unity of the Holy Ghost, one God Forever and ever. R.Amen. SECRET for the SECOND MASS OF THE DAY Be propitiated, O Lord, by our supplications for the souls of Thy servants and handmaids, whose anniversary is kept to-day, for whom we offer Thee the sacrifice of praise, that Thou vouchsafe to join them to the company of Thy saints. Through our Lord Jesus Christ Thy Son our Lord, Who liveth and reigneth with Thee in the unity of the Holy Ghost, one God Forever and ever. R.Amen. SECRET for the THIRD MASS OF THE DAY O God, Whose mercy is boundless, mercifully receive the prayers of our lowliness, and grant, through these sacraments of our salvation, to the souls of our brethren, kindred, and benefactors, to whom Thou didst grant the confession of Thy name, the remission of all sins. Through our Lord Jesus Christ Thy Son our Lord, Who liveth and reigneth with Thee in the unity of the Holy Ghost, one God Forever and ever. R.Amen. POSTCOMMUNION for the FIRST MASS OF THE DAY May the prayer of Thy suppliant people, we beseech Thee, O Lord, avail for the souls of Thy servants and handmaidens: that Thou mayest both deliver them from all their sins, and make them to be sharers in Thy Redemption. Who livest and reignest, with God the Father, in the unity of the Holy Ghost, one God For ever and ever. R. Amen. POSTCOMMUNION for the SECOND MASS OF THE DAY Grant, we beseech Thee, O Lord, that the souls of Thy servants and handmaids, the anniversary of whose burial we commemorate, may be purged by this sacrifice and obtain alike forgiveness and everlasting rest. Through our Lord Jesus Christ, Thy Son, Who liveth and reigneth with Thee in the unity of the Holy Ghost, one God For ever and ever. R. Amen. POSTCOMMUNION for the THIRD MASS OF THE DAY Grant, we beseech Thee, O almighty and merciful God, that the souls of our brethren, kindred, and benefactors, for whom we have offered, this sacrifice of praise to Thy majesty, being purified of all sins by the virtue of this sacrament, may, by Thy mercy, receive the beatitude of perpetual light. Through our Lord Jesus Christ, Thy Son, Who liveth and reigneth with Thee in the unity of the Holy Ghost, one God For ever and ever. R. Amen.